We are saddened to hear of the death of Aliki Faipule Foua Toloa, a stalwart of Solar Head of State's advisory board. Foua was a true champion of renewable energy and a world leader in the fight against climate change. Due to ill-health, Foua recently resigned from his post as Faipule of Fakaofo, political leader of one of the three atolls that make us the Pacific Island nation of Tokelau. Foua has served in this role for many years, as well as that of Ulu o Tokelau (Head of State). During this time he helped lead a successful campaign to provide all of Tokelau's electricity from renewable energy, by installing almost 1MW of solar panels spread over the three atolls. Tokelau is severely threatened by climate change and sea level rise, lying just a few meters above sea level. By leading the way in renewable energy, Foua was adamant that Tokelau could prove 100% renewable electricity was possible. This project lead to inspire many other Pacific Island nations to follow in Tokelau's footsteps and place their own 100% renewable energy goals for the near future. 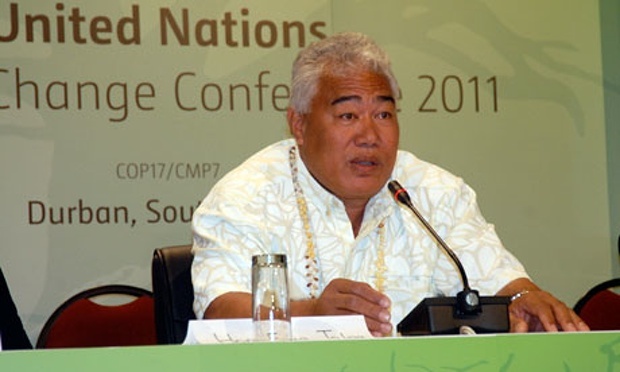 As a man of strong faith and charismatic leader, Foua spoke at the United Nations Climate Talks in Durban back in 2011 and challenged other nations to learn from Tokelau's experience. Speaking on behalf of Tokelau, he told the crowd, "we have no intention of leaving. This is a God-given land, we have a culture, a language, an identity and a heritage. We want to preserve Tokelau for future generations." Thanks to Foua's work, Tokelau is much closer to retaining its land and identity for the inhabitants' descendants. Foua was an inspiration to all of us, and a true climate change leader. Our hearts go out to his friends and family at this difficult time, and we hope his solar legacy will live on through our work and his impact worldwide and in Tokelau.